Johnston climbing in the Himalayas. Emily Johnston crosses the ladder on the Khumbu Icefall at 17,999 feet on the Nepali slopes of Mount Everest. Johnston on her 100th summit of Mount Rainier. The Seattle-native began guiding the mountain in 1989. Emily Johnston is a doctor, mountaineer, and skier based in Teton Valley, Idaho. On Jan. 9, she will kick off Teton County Library’s 2019 Mountain Story series by giving a talk about her experiences guiding Mt. Everest. Teton County Library will kick off its Mountain Story literary festival next week with a talk by Emily Johnston at the library’s Alta Branch. 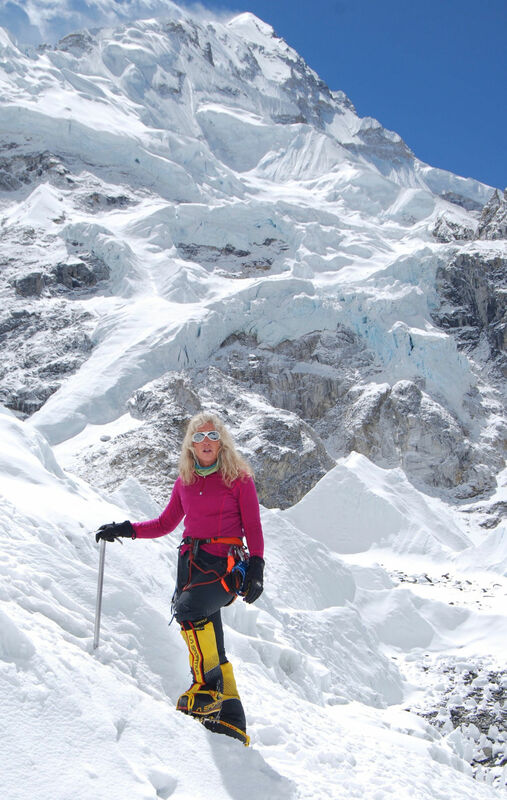 Johnston, an Idaho-based mountaineer (among many other talents), will speak about her experience guiding and working as an emergency medicine doctor on Mount Everest during the devastating 2015 Nepali earthquakes and avalanches. “The heart of the talk, though, is about how really anybody can do that,” she said. Johnston has been climbing since the age of 12. At 54, she has climbed six of the Seven Summits and has guided on Denali, Everest and Mount Rainier. She has been a raft guide, ski patroller, ER doctor — and the list goes on. Having worked seasonal and travel jobs her whole life means Johnston is away from her home more often than not. It also means that she has a network of friends and memories across the globe. Just last week, she returned from her post as an ER doctor in Sioux Falls, South Dakota. She will travel to Portland, Oregon, on Friday for a wilderness medicine conference. Between ER stints, Johnston is a ski patroller at Grand Targhee Resort. Later this year, she will teach a weeklong raft guiding course, return to Everest to guide in the spring, and go back to Mount Rainier in the summer. “I’m so lucky because early on I got in touch with these great communities,” she said, speaking about the large extended families in rafting, patrolling and climbing. After climbing on almost every continent, Johnston is a strong believer that the mountains should be for everybody. Johnston has lived in a lot of mountain towns and rejects the mountain-town ethos about entitlement to or “ownership” of mountain access. “One of the things that I encourage and that I would like to see more of is mentoring people that are coming in,” she said. So when Johnston says something like “Anyone can climb Everest,” she means it. Johnston’s talk is the first part of Teton County Library’s Mountain Story festival. In addition to Johnston’s talk, the library is hosting events with writer Annette McGivney, artist and pro snowboarder Bryan Iguchi and rock climber Alex Honnold in coming weeks. All events are free. See TCLib.org for information, and look out for a preview of the rest of the series in the Scene section of next week’s Jackson Hole News&Guide. Contact Julie Kukral at 732-7062, entertainment@jhnewsandguide.com or @JHNGscene. Scene Editor Billy Arnold covers arts and entertainment. He apprenticed as a sound engineer at the Beachland Ballroom in Cleveland, Ohio before making his way to Jackson, where he has become a low-key fan of country music. No personal attacks. Discuss issues & opinions rather than denigrating someone with an opposing view. No political attacks. Refrain from using negative slang when identifying political parties. Be truthful. Don’t knowingly lie about anyone or anything. Be proactive. Use the “Report” link on each comment to let us know of abusive posts. Share with us. We’d love to hear eyewitness accounts or history behind an article. Use your real name: Anonymous commenting is not allowed. If you share a web address, please provide context as to why you posted the link.